Today, you have more ways to reach potential customers than ever before. But the more channels you utilize, the more difficult it becomes to determine which channels are really providing value. This is because your customers’ path to purchase has become a lot more complex. Marketing attribution is the process for determining which marketing touchpoints led to a conversion (e.g. a signup, download or purchase). An attribution model is the rule, or set of rules, that determines how conversion credit is assigned to different marketing touchpoints. Attribution models can be single-touch or multi-touch. Single-touch attribution models assign 100% of conversion credit to one marketing touchpoint. Even if a customer saw 20 ads before converting, single-touch attribution will determine that only 1 of the 20 ads deserves conversion credit. Single-touch attribution models are easy to implement because of their low level of complexity. They’re also the most popular attribution models because of their historical tie to Google Ads (formerly AdWords). Let’s take a closer look at single-touch attribution models. We’re going to use soccer as an analogy to describe how they work. With a first-touch attribution model, your first marketing interaction receives 100% of the credit. In the soccer game, we’d give all the credit to Player A. If you’re mainly focused on widening top of your funnel, this is a useful model. It highlights the channels that first introduced a customer to your brand. The problem? It ignores all subsequent touches, and therefore provides no insight into your down-funnel metrics. A Facebook ad may send you a lot of website traffic, but probably isn’t the sole influencer in a conversion. Last-touch attribution assigns 100% of the credit to the last marketing touchpoint. This model would give all the credit to the striker (Player E in the image below). You could argue that the last touch is all that matters because it resulted in the actual conversion, but it doesn’t tell the whole story. Your customers are likely engaging with your brand across multiple touchpoints on various channels before they convert. While single-touch only gives credit to one marketing touchpoint, multi-touch assumes that all touchpoints play some role in driving a conversion. We’ll look at the most popular MTA models which include even-weight, time decay and machine learning. Often referred to as linear, even-weight distributes all credit evenly. In a soccer game, all players would receive the same amount of credit for scoring a goal. Even-weight is more sophisticated than a single-touch model — it doesn’t ignore all the touchpoints in the middle of the conversion path. The downside is that not all touchpoints are created equal. This model essentially says that every soccer player gets awarded for participating, which is unfair to the rockstars. Time decay assumes that the closer a touchpoint is to a conversion, the more influential it is. 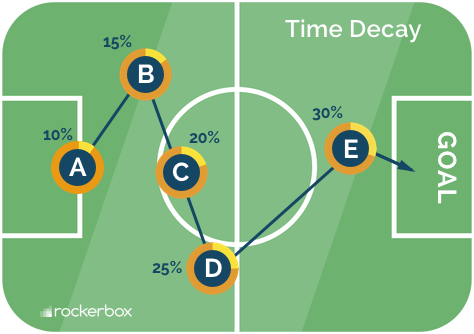 With a time decay model, the soccer players closest to the goalpost receive the most credit. While time decay acknowledges that not all touchpoints are created equal, it’s still flawed. Let’s say someone reads a powerful article on your website that makes them want your product. The next day, this person is retargeted with an ad. Is the ad really doing more heavy lifting in earning the conversion? Also known as the U-shape model, the position-based model gives 40% of conversion credit to the first and last marketing touchpoints. The remaining 20% is distributed evenly among all touchpoints in between. In the soccer game, Players A and E receive the most credit while the remaining players are acknowledged to a lesser degree, equally. If the touchpoint that grabs customers’ initial interest and the touchpoint that ultimately converts them are deemed most important, this model works well. The drawback is that if your business really needs a second or third touchpoint to convert a customer, this model won’t properly acknowledge it. Machine learning MTA models (commonly referred to as data-driven MTA models) use your historic data to create rules for assigning credit to each of your marketing touchpoints. In the soccer game, each player’s value would be determined based on his or her performance throughout multiple plays. Implementing a machine learning MTA model used to be challenging. For instance, it requires having access to the historical data of your marketing activities, as well as a tool to analyze performance patterns. Challenges aside, this model brings you a lot closer to determining the true value of each marketing touchpoint. There’s no perfect science for choosing an attribution model. If you have a short and simple marketing funnel, a single-touch model may be effective enough. If you’re marketing on various channels and have many touchpoints, a multi-touch attribution model is the way to go.